Lt. Col. Theodore F. Wickord was born on August 2, 1907, in Chicago, to Peter H. Wickord & Julia Nevecerel-Wickord. He married Marie Falisiewicz and with his wife lived at 1839 South 7th Avenue in Maywood, Illinois. The couple became the parents of two sons. He was employed as a Field Engineer by the Public Service Company of Northern Illinois, in its operating department, which supplied gas and electric power to the Chicago area. 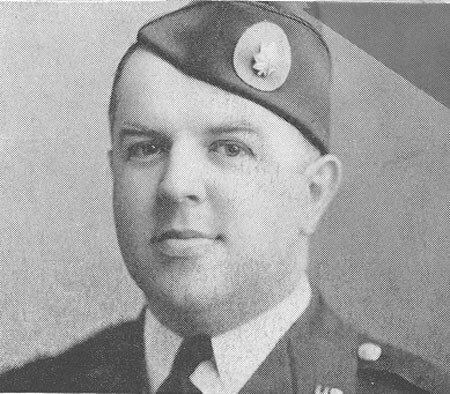 Wickord started his military career in the Citizens Military Training Corps in 1924 and 1925. He next joined the 33rd Infantry in Chicago and remained with the unit from 1926 to 1927. On June 9, 1927, he joined the Illinois National Guard's tank company in Maywood, Illinois, and was commissioned a 2nd Lieutenant on April 14, 1936. He was promoted to 1st Lieutenant on May 3, 1937. From February to May 1940, he attended tank school at Ft. Benning, Georgia. On November 7, 1940, he was promoted to captain and became the commanding officer of 33rd Tank Company when they were called to federal service on November 25, 1940. When Headquarters Company was formed, in January 1941, with soldiers from the four letter companies of the 192nd Tank Battalion, Capt. Theodore Wickord became the Executive Officer of the battalion. In early September, the battalion traveled to Camp Polk, Louisiana, to take part in maneuvers. After the maneuvers, they remained behind instead of returning to Ft. Knox. It was at this time, officers of the battalion, too old for their rank, were released from federal service. This included the battalion's commanding officer. The command of the battalion was offered to Capt. Walter Write of Janesville, Wisconsin, who turned the command down to remain with A Company. As a captain, Wickord assumed the command of the 192nd Tank Battalion as it prepared for duty in the Philippine Islands. He was also promoted to major. Traveling west over different train routes, the battalion arrived in Ft. Mason in San Francisco, California, and were ferried on the U.S.A.T. General Frank M. Coxe to Ft. MacDowell on Angel Island, where they received inoculations and physicals from the battalion's medical detachment. Those who did not pass the physicals were transferred out of the unit, or held back and scheduled to rejoin the battalion at a later date. On Wednesday, November 5, the ship sailed for Guam but took a southerly route away from the main shipping lanes. It was at this time it was joined by, the heavy cruiser, the U.S.S. Louisville and, another transport, the S.S. President Calvin Coolidge. Sunday night, November 9, the soldiers went to bed and when they awoke the next morning, it was Tuesday, November 11. During the night, while they slept, the ships had crossed the International Date Line. On Saturday, November 15, smoke from an unknown ship was seen on the horizon. The Louisville revved up its engines, its bow came out of the water, and it shot off in the direction of the smoke. It turned out the smoke was from a ship that belonged to a friendly country. At Ft. Stotsenburg, the soldiers were greeted by General Edward P. King who apologized that they had to live in tents along the main road between the fort and Clark Field. He remained with the battalion until every member had had Thanksgiving dinner. Afterwards, he went to have his own. On December 8, 1941, just ten hours after the Japanese attack on Pearl Harbor. Major Wickord lived through the attack on Clark Field. Having heard the news of the attack on Pearl Harbor, his tanks had been deployed around the perimeter of the airfield. This was done to prevent the Japanese from using paratroopers to capture the field. When the planes approached the airfield, Wickord took his camera, that he had bought so that he could film his time in the Philippines, and filmed the planes. He stood like the other men in awe of the planes. It was only when he saw the bombs falling from the planes, through the magnification of the camera lens, that the spell was broken. He threw the camera down and ordered his men into action. Sometime around December 21, Wickord was promoted to Lt. Colonel. On that day, he was given orders to send a platoon of tanks north to Lingayen Gulf . As it turned out, the tanks he sent were from B Company his original company of Illinois National Guardsmen. It was at this time while he was riding on the back of his tank, that a tree branch knocked him from the tank. The result was he suffered a back injury that would bother him the entire time he was a Prisoner of War. Under Lt. Col. Wickord's command, 13 tanks of the 192nd were deployed as the rear guard of the North Luzon Force as it retreated into the Bataan Peninsula. On December 23 and 24, the battalion was in the area of Urdaneta. The bridge they were going to use to cross the Agno River was destroyed and the tankers made an end run to get south of river. As they did this, they ran into Japanese resistance early in the evening. They successfully crossed at the river in the Bayambang Province. During the withdraw into the peninsula, Wickord crossed over the last bridge which was mined and about to be blown. He wanted to see if all Allied forces had crossed the bridge. On the other side of the bridge, he discovered a company of his tanks parked along the road. The crews were asleep inside the tanks. The company was awakened and became the last American unit to enter Bataan. Over the next several months, the battalion fought battle after battle with tanks that were not designed for jungle warfare. The tank battalions , on January 28, were given the job of protecting the beaches. The 192nd was assigned the coast line from Paden Point to Limay along Bataan's east coast. The Japanese later admitted that the tanks guarding the beaches prevented them from attempting landings. The other method to use to kill the Japanese was to park a tank with one track over the foxhole. Driver gave the other track power resulting with the tank spinning around and grinding its way down into the foxhole. The tankers slept upwind of their tanks. For five days, during the Battle of the Anyasan Pocket, American tank forces had attempted to recover a tank as salvage. It was during this battle that Lt. Col. Wickord, personally led an effort to recover a tank. On February 6, while under heavy fire, Lt Col. Wickord took his own command tank into combat to tow out the disabled tank. The crew of the tank had been killed and the tank was being used by the Japanese as a hostile strong point. Lt. Col. Wickord's actions inspired the supporting tank maintenance and tank troops to make the salvage possible. For his actions on this day, Lt. Col. Wickord received the Silver Star for gallantry in action. On April 8, at 6:30 P.M., Wickord received this message from General Weaver the commander of the Provisional Tank Group: "You will make plans, to be communicated to tank company commanders only, and be prepared to destroy within one hour after receipt by radio, or other means, of the word CRASH, all tanks and combat vehicles, arms, ammunition, gas, and radios, reserving sufficient trucks to close to rear echelons as possible thereafter." The tankers received the order at 6:45 A.M. on April 9, and Bataan was surrendered to the Japanese at 7:00 A.M.. It was on this date that Lt. Col. Ted Wickord became a Prisoner of War. He was aware like the other members of the battalion that the Japanese had promised that the Americans would be loaded onto ships and sent to San Francisco. Smelling something rotten, he attempted to get his men taken to Manila. Unfortunately, when the trucks they were riding in stopped, they found themselves at Mariveles at the southern tip of Bataan. It was from there that Lt. Col. Ted Wickord began what was to become know as the "Bataan Death March" on April 11, 1942. On the march, Lt. Col. Wickord witnessed the kindness and great courage that the Filipino people showed by throwing food to the starving POWs. The Filipinos would make balls out of rice and throw them to the marchers. The marchers had to catch the rice balls "just right" or they would disintegrate and the POWs would get nothing to eat. Of the march, he said , "The heat was terrific. . Pith helmets were selling for $50 and $100. The Japanese bayoneted and machine gunned men who tried to get get drinks out of the artesian wells in the area." It took Lt. Col. Wickord four days to complete the march and reach San Fernando. It was there that a Japanese officer told the American prisoners that all American cities had been blown off the face of the map. The officer would say, "Chicago - boom, boom! No more! Detroit -boom, boom! No more! " One prisoner shouted, "Baloney!" The officer answered, "Baloney-boom, boom! No more!" As a POW, Lt. Col. Wickord arrived at Camp O'Donnell on April 18. The camp was an unfinished Filipino training base that was pressed into use as a POW camp on April 1, 1942. When they arrived at the camp, the Japanese confiscated any extra clothing that the POWs had and refused to return it to them. They searched the POWs and if a man was found to have Japanese money on them, they were taken to the guardhouse. Over the next several days, gunshots were heard to the southeast of the camp. These POWs had been executed for looting. While at Camp O'Donnell, he was selected to be the American commanding officer of a work detail that was being sent out to rebuild bridges. He wrote down that detail left Camp O'Donnell on May 1st with 1000 POWs on it. Upon arriving in Calaun, the work group was divided into three details of 250 men or more. Two details would build bridges while the other detail would work at a sawmill providing lumber. Lt. Col. Wickord filled as many of the worker positions on this detail with men of his own battalion to get them out of the Camp O'Donnell. Since at this time, as many as fifty men a day were dying in the camp, it was his hope that doing this would save some of their lives. On the detail, he was also given the authority to decide which prisoners were strong enough to work that day and which ones were not strong enough to work. While in command of this detail, one POW assigned to the sawmill detail escaped during the night. Because of this, Lt. Col. Wickord was informed by the ranking Japanese officer that he was being sent to the sawmill to witness the execution of ten prisoners because the one POW had escaped. The American commanding officer of the sawmill detail was told by the ranking Japanese officer that he had to select ten prisoners for execution. The officer first considered a lottery to select who would die, but later decided that the five men who had slept nearest to the escapee's left or right would be executed. No matter what decision the officer made, he could not win. The morning of the execution all the POWs were silent. Finally, one of those selected to be executed asked the American commanding officer if there was some way he could stop the execution. The officer simply said , "No." Another of the chosen men simply said, "I guess I'll never see Denver again." Still another of the "selected" POWs was the brother of another POW on the detail. Even though other POWs offered to take his place, the Japanese would not allow the switch. The prisoners were offered blindfolds but refused them. They were lined up next to their grave and shot. After the execution, Lt. Col. Wickord was shown the grave and told that he had to tell his men what had been done because one POW had escaped. He was told to inform his men that if they attempted to escape the same thing would be done to them. As it turned out, a prisoner on the bridge detail attempted to escape. The man made a break and ran down the main road in Calaun before being stopped by a guard. The Filipino doctor who provided medical treatment to the Americans convinced the Japanese that the POW was mentally ill and could not be held accountable for his actions. By doing this, the doctor saved the lives of the ten other prisoners. The POW who had tried to escape was returned to the main camp. After the bridge building was completed at Calaun, the POWs were sent further south to Batangas. Again, the prisoners rebuilt a bridge that had been destroyed. There the Sisters of the Good Shepherd invited twelve POWs for a dinner. The Japanese commanding officer gave his permission and allowed Lt. Col. Wickord to pick the twelve men. Lt. Col. Wickord picked six Catholic and six Protestant POWs who were the most emaciated. The thirteen men were allowed to attend this meal with only one guard. Wickord stated that one day while on the detail, someone found a tube of Colgate toothpaste. The toothpaste was the start of a meal that Wickord said , "didn't taste bad at all." They filled a bowel with about a half inch of water grated in some orange peals they had found, and then squeezed in the toothpaste. The toothpaste gave the mixture a peppermint taste. Again the prisoners were moved to build another bridge. This time they were moved north to Candelaria. The prisoners slept in an old coconut mill which was surrounded by fencing. Again, the Filipino people showed their courage by aiding the prisoners. Twice a week two Filipinos would bring bread and food to the POWs to supplement their diet. While working on the detail, Wickord told of a Japanese guard who was somewhat decent to the POWs. The guard told Wickord he could go to the PX and get himself unsweetened gelatin. Wickord knew from having it before that it had no taste, but it would provide him with some nourishment. When Wickord had eaten it, he thought of the other fourteen men he was working with and bought fourteen packs of cigarettes and took them to the men. The guard that sold him the cigarettes at the PX reported him to his commanding officer. Another guard asked Wickord if he had purchased the cigarettes. When Wickord stated he had, he was taken to the commandant's office and questioned. The Japanese were angry because he had bought so many cigarettes. Wickord was marched out of the office by three guards, two with fixed bayonets. The three guards led him to a wall and beat him unconscious with their fists. The guard who was relatively nice to the POWs came up to Wickord, the next day, and offered him a little doll that was dressed like his sister had been at her wedding. The guard was extremely upset about the beating. When this detail was completed, he was sent to Cabanatuan. The camp was actually three camps. Camp 1 was where the men who captured on Bataan and taken part in the death march where held. Camp 2 did not have an adequate water supply and was closed. It later reopened and housed Naval POWs. Camp 3 was where those men captured when Corregidor surrender were taken. In addition, men from Bataan who had been hospitalized when the surrender came were sent to the camp. Camp 3 was later consolidated into Camp 1. The camp hospital consisted of 30 buildings that could hold 40 men each, but it was more common for them to have 100 men in them. Each man had approximately an area of 2 feet by 6 feet to lie in. The sickest POWs were put in "Zero Ward," which was called this because it was missed by the Japanese when they counted barracks. The Japanese put a fence up around the building to protect themselves and would not go into the area. There were two rolls of wooden platforms around the perimeter of the building. The sickest POWs were put on the lower platform which had holes cut into it so the they could relieve themselves. Most of those who entered the ward died. The POWs boarded the Nagato Maru at 5:00 P.M. on November 6. The POWs were pushed into the forward hold which the Japanese believed could hold 600 men without a problem. In an attempt to get the POWs into the hold the Japanese beat them. When the Japanese realized that beating them was not working, they concluded that the hold could not hold 600 men. It was at that time they lowered the number of men in the hold to somewhere between 550 and 560. This meant that nine men had to share an area that was 4 feet, nine inches, by 6 feet, 2 inches. All the holds on the ship were packed with men in the same manner. With him, were Capt. Ruben Schwass, Lt. Richard Danca, Lts. Tom Savage and Ben Morin, and Sgt. Jack Griswold. He stated that there were 600 POWs in the forward hold and 400 in the rear hold. The POWs had barely enough room to sit down if their knees were drawn up under their chins. The heat was also unbelievable, so the Japanese allowed small groups of POWs up on the deck at night in shifts. The Nagato Maru sailed on November 7, 1942.
ship. As they disembarked, each POW received a chip of red or black colored wood. The color of the wood determined what camp the POW was sent to. In addition, once on shore, they were deloused and issued new uniforms. By ferry, the POWs were taken to Himoneski, Honshu, where they were loaded onto a train and took a long ride along the northern side of the Inland Sea to the Osaka-Kobe area. There, the prisoners were divided into two groups according the color of wood they had. Wickord was sent to Tanagawa Camp arriving there on November 27, 1942. The POWs arrived at night and were housed in five flimsy barracks that were unheated and had dirt floors. The POWs slept on two sets of platforms along the perimeter of each barracks. To reach the upper bunks the POWs used ladders. Each POW received five blankets made of peanut shell fiber and a pillow stuffed with rice husks. Corporal punishment was common in the camp and done for the slightest reason or for no reason and were a daily event. One guard in the camp, Tsunesuke Tsuda, beat the POWs the most because he wanted to break their spirit and humble them. Most of the beatings took place at morning or evening muster while the POWs were at attention. The POWs were punched, slapped, clubbed, kicked, hit with shoes and belts, and even furniture was used on the POWs as they stood at attention from 2 to 2ݠhours. Some POWs were hit in the throat which resulted in their not being able to speak for a week. He beat the POWs so severely and often, that he was required to sign a statement not to beat the POWs under penalty of death. No real reason was needed for the beatings, but a violation of some camp rule usually was the given reason. If a work group of POWs did not remove their quota a material from the work site, they received a beating. Usually, the reason they failed to meet the quota was they were to hungry and weak to meat the quota. While being beaten, the POWs were forced to hold a heavy log or rock above their heads. In mid-January 1943, Wickord was one of 150 officers who left Tanagawa and sent by rail to the Island of Shikoku to a camp at Zentsuji and arrived on January 15, 1943, which was to be his home for the next two and one half years. The camp was used in Japanese propaganda to show how well the POWs were being treated. In all, there were 700 officers and enlisted men in the camp, and he met American officers who were not captured in the Philippines, as well as, British and Australian officers. At night the POWs read books by the light of a 15 watt light bulb that hung high above their heads. After reading for hours, the POWs no longer felt hungry. This allowed them to fall asleep even though fleas and rats were crawling over them. Wickord was one of the officers selected to go to another camp. The POWs were boarded into boxcars and baggage cars, but by this point in the war, American planes roamed the skies over Japan at will. During the trip, on several occasions, the Japanese uncoupled the engine from the cars, and left the cars sitting on the rails as a target, when they believed the train was going to be strafed. The POWs made it safely to their new camp. The final camp Wickord was held at was Rokuroshi which opened on June 25, 1945, and was located next to the great Zen temple about twenty miles northeast of Ono. The POWs worked as stevedores at rail yards and a port. When the areas around a train station and the train yards were bombed, the Japanese locked the POWs in the baggage and boxcars and took shelter in air raid shelters. Of his time in the camps he recalled , "We certainly had some odd concoctions in the way of 'food.' We had rice for every meal, regardless of what camp we were in; once in awhile we were given some 'vegetable' soup. The soup had the roots of weeds, leaves of sweet potatoes, horse bones, and sometimes cucumbers in it. Afterwards, the meatless bones would be carefully saved and used a few more times. Finally, they would be raffled, and the lucky winner could then break open the bones and scrape out the marrow to eat." In June, the POWs managed to smuggle a newspaper into the camp and read that Okinawa had fallen to the advancing American forces. Wickord remained a prisoner at Rokuroshi until he was liberated on September 7, 1945, and the next day they boarded a train to Yokohama. There, the former POWs were greeted by an American band playing the song, "California, Here I Come." Many of the POWs became overwhelmed by their emotions. They were taken down to the docks where a meal of hot cakes, jam, butter, and coffee was waiting for them. The men were returned to the Philippine Islands. He returned to the Philippines on the U.S.S. Tryon, and after receiving medical treatment, he was sent home on the U.S.S.Storm King, which arrived at San Francisco on October 15, 1945. From there the former prisoners were taken to Letterman General Hospital for additional treatment. Wickord was promoted to the rank of colonel in September 1945, and returned to Maywood to his wife and two sons. He was discharged from the army on November 15, 1946. After the war, Wickord returned to the Public Service Company of Northern Illinois and was associated with safety work. On January 19, 1952, he was appointed safety supervisor for the Public Service Company, in charge of all the safety activities for the company's five divisions covering 11,000 square miles in the northern part of Illinois. Theodore Wickord passed away on October 16, 1967, and, after a funeral service at St. Eulalia's Church in Maywood, was buried at Saint Joseph Cemetery in River Grove, Illinois.